Wizard Ways © 1996 Aristocrat. 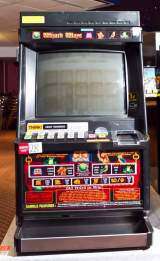 A video slot machine with 5 reels incorporating the '243 Ways' system. Runs on the Aristocrat MKV Series 1 hardware. The 'Bet Max' button automatically selects 4 credits x 243 Ways for the 100 credit maximum bet. Any reels not specified pay on centre line only. For instance "27 Ways" selects the first 3 reels and the last two pay in the centre line only. 1, 2, 4 credit and Bet Max buttons are also used for Heart, Diamond, Club and Spade double up respectively. This gamble is x4 if correct. 3 and 243 ways buttons are also used for red/black double up. This is possibly the first '243 Ways' game released - I have never seen any other Series 1 machine with 243 Ways. Most likely this game was updated to the 'Wicked Winnings' category, it is similar although there is no multiple symbol feature.